Hiking the Green Gardens Trail in Gros Morne National Park will take you through the Tablelands, into a mountain valley, and then down to the Gulf of St. Lawrence coast. This is a wild place with breathtaking views of sea stacks, rock beaches, and Tuckamore. Tuckamore was a new word for me. 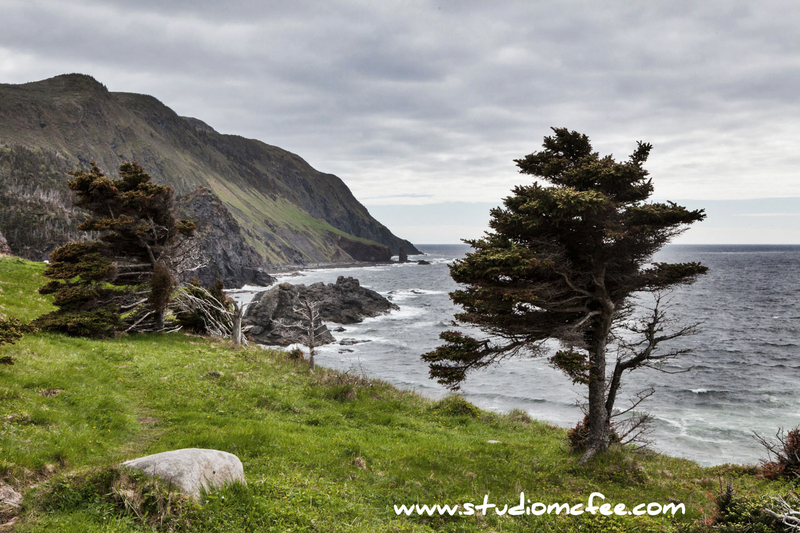 It's a Newfoundland term for the stunted balsam and spruce trees that grow along the coast and up in the mountains. Typically these trees appear almost dead on the windward side but alive and flourishing on the leeward. They are strangely compelling and add dramatically to the mystique of these wild lands. Newfoundlanders even talk about the 'smell of the Tuckamore' as the scent of the wild. While Gros Morne mountain and Western Brook Pond fjord are often featured in promoting Gros Morne National Park, I found myself thinking that 'Green Gardens' deserves equal billing.